Whether you’re a small town shop owner or a huge online eCommerce platform, social media plays a huge role in keeping your business relevant in today’s digital age. Social media is one of the most powerful means of engaging potential clients and to increase your brand awareness. 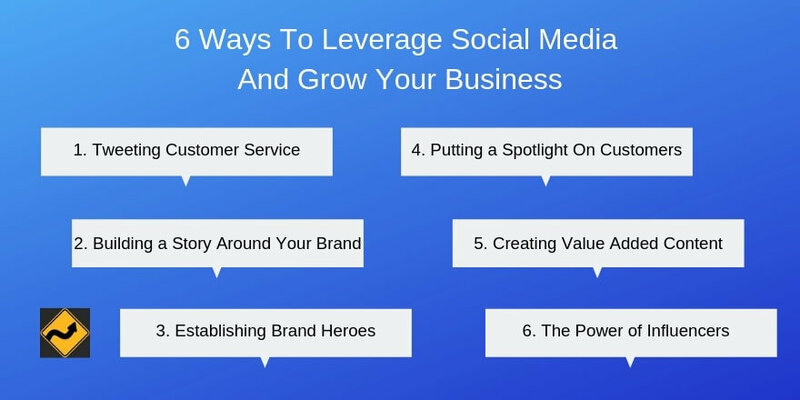 How do you leverage social media to help grow your business? We break down the main ways on how social can be an integral part of your digital marketing strategy if you use it correctly. Social media can be an excellent tool for any brand or business to keep their customers happy. When you have happy customers, you’ll cultivate brand loyalty and lifetime devotees. Providing quality customer service is a sure-fire way of ensuring customer loyalty. They are more likely to buy from a brand when they know that any concerns or issues will be handled immediately. Generally, customer service inquiries are handled via phone, email, or live chat support. In some cases, however, it’s much faster to dispatch support and pay attention to user needs on social media. Twitter is one particular platform that’s great for handling customer service issues. When you use social media to provide and handle customer service, it shows other users that your business and brand supports its products and will go the extra mile to service its customers. Social media channels have always been a great platform to showcase your brand’s personality. With social media, you can talk directly to your users and customers and let them get to know your brand better. Building a rapport with your users translates into brand loyalty and creates potential customers. Social media is inherently visual in nature which makes it easy for brands to create stories about their products and themselves. Particularly for eCommerce brands, marketing isn’t just about showcasing a product or highlighting their services, it’s about building a lifestyle or a belief that defines the products you’re selling. Use social media to share a lifestyle that’s built around your business and make it so that users aspire to be part of your brand. People love to shop with brands that they can trust. Pulling back the curtain and revealing the people that work behind scenes is a great way to build trust towards your users. When you put the spotlight on some of your company’s heroes, it makes your brand feel less like a corporate entity and more like a friend. Xbox is a major console game company that’s a part of Microsoft. Larry Hryb, referred endearingly as “Major Nelson”, is their Director of Programming and has cultivated a major following on his social media accounts. With 1.2 million and 45.5k followers on Twitter and Instagram respectively, it shows how important personality is for a brand. So now that you’ve built up your brand’s presence, it’s time to engage with them on a meaningful level. Of course, when you’re talking about engagement, you’re going to have to talk about content. One of the best ways to engage your users and customers is to push and promote the content that they’ve created on your platform. More often than not, your users are already working on establishing their own social media presence—taking a selfie with their new pair of shoes or dress. When you feature the content they created on your platform, it makes your users feel like they are appreciated by your brand. Sharing users’ content is great, but it’s not enough. You also need to make and share your own content that’s high quality, useful or entertaining. When you have content that’s engaging and also useful, you give your users a reason to keep coming back to your site and stay there, other than to just shop around. Get them to stay long enough and they end up shopping anyway. Of course, the other great benefit of having quality content is that it will improve your organic presence in search engine rankings. Google loves content that solves people’s problems and putting that content on social media ensures that it gets seen by a lot of people. There are plenty of advertising opportunities in social media. Since a majority of your potential customers are on social media, it’s worthwhile to consider investing in social media ads as part of your social strategy. Influencers are sort of the taste-makers of the social media landscape. A lot of people follow them because they offer insights into things that are trendy, fashionable or cool. Using social media influencers is a great way to promote your brand to a whole new audience. Partnering with the right social media influencer that’s related to your business can help improve your brand awareness vastly. Plus, most influencers tend to have high numbers of followers who are willing and wanting to buy anything that they are seen using or wearing. When you’re a business that already has strong aesthetics and personalities, you can use that to your advantage and build up an engaged social media following. With social media, you can use that platform to build up your brand loyalty, tell your brand’s story, and most importantly, serve your customers’ needs better. All these will help grow your business and brand to another level. Good read, I really liked the way you have explained the topic of engaging user and building brand using social media. It really hurts to see if a brand is completely focusing on pushing content only with zero or negligible interest in engagement with customers. I think content curation can help brands in improving their engagement. As through content curation brands/business can send regular informative posts to their audience. And, the social media time can use the time in engagement and solving queries of customers/audience. Don’t want to be salesy but you can check Smm.AI if you are looking forward to improve your engagement with the customers or branding through content curation. When you comment, you cannot put URLs in the Twitter field. They won’t work because it adds twitter.com to the front of them. I have requested support to give us the ability to remove them, but for now all I can do is either leave it or delete your comment. That was quite very informative to know about that Social media is one of the most powerful means of engaging potential clients and to increase brand awareness. These are some fantastic tips for using social media. As we all know word-of-mouth can make or break your brand. I like the fact that in one of your tips you have as putting the spotlight on the consumer. To me it seems so simple to make that customer feel like “family” and I really don’t understand as to why more and more companies don’t go this route. I recently read how Budweiser enabled a customer to craft a beer for them to see how that was going to go. This is just one example of putting the spotlight on the customer. Thank you for the intriguing tips and I can’t wait to think outside of the box for some of these tips for my use as well. Great tips, Azreen. I think a company utilizing social media for customer service also shows a level of transparency. Everyone can see what the issue/complaint it, and see how the company is handling it. It is sort of an FAQ at the same time, I have often looked to see if others have had the same issues, even before buying something. And, it makes a lot of sense to share your content on social media, makes it easier for someone to find and click on it to visit your site. Social media is best way to grow business rapidly. I think if anyone follow this 6 rules which you mentioned in post,it would be easy way for everyone. With the help of social media you would get to know about customer interest & behaviour. social media is a great way of business to achieve our goal through digital marketing . Great writing skills you run your blog very nicely all the topics that you mentioned in your blog is user friendly. Thanks for sharing! A well-written article brief and informative. Social media is the main region that promotes our business or a product like a brand, without social media I will try to use traditional marketing that gives us business but not makes our business a brand in current time. What! a awesome piece of content! Bookmarked site for more information in future. A well written informative Article. Yesm exploring paid media is the best way to grow our business. If we spend much, in return we will earn much. “Building a Story Around Your Brand” – i agree with the advice, it is an important step to grow a social media. Its true Social media has become the most useful platform to make people aware of your brand. And it also helps in getting the insights about the customers interests and behavior. So basically social media is playing a great role in the growth of businesses. Thanks for this informative article and helpful tips. Great article. I like the fact that you have gone in depth to make this blog so informative and useful for everyone. I really appreciate. Thanks for sharing. Great article! Thank you for sharing. Social media is the best way to grow your audience. Social media can help you leverage your business on a very large scale and that’s the best part about it. You’re right. If businesses do not leverage their online presence, they’re missing out a lot. They’re also missing out the opportunity to reach out to a LOT of potential customers. Thank you so much sharing these informative ideas. Social Media Marketing is now becoming an important task for every business. I’m trying to know more about these topics because I’m working on it a little bit. Thank you so much again for share this. Thanks for sharing these worth tips! I strongly believe that sharing valuable content with the world will grow our fan following. We just need to publish the valuable content the internet users have been looking for and sharing it on social media with eye catchy Titles! This definitely will make your brand name popular. This is best way of implementation in social media and grow your business and having right articles here, what i found in this post, nice to see you here . Absolutely a great post here. It has a lot of key elements that truly make it work. Love your post. I love the way to promote on social media. Great Thanks again! Anant Vijay soni would love you to read ..How to Create a WordPress Website, Blog and eCommerce Store. but the proper use or methods is the key and your article help the reader have the key. Thank you for writing this article. This article has lot of information about social media leverage. register on Fixpocket and start freelancing with social media marketing if you are good in social media marketing. This post is good for social media grow your business and having right articles to see you here and thanks a lot for sharing with us. social sharing growing business is the second step first tep is to make yr beautiful website which you promote to get visitors on your site. thanks for your great information. it may helps me to grow my own business and also helps me to co-operate my staffs and consumers. Ive recently started my new brand and Ive taken previous social media service into consideration for my brand. When I tweet a company and they reply it is much appreciated. If your accounts arent going to be monitored and responded to in a timely manner they perhaps you shouldnt advertise that social channel. Thoughts? All these social media trends and tactics are just awesome. Such types of blogs are helpful for social media marketers so i hope you share more information in future also. Keep it up!!! Social media is a great way to increase your audience. Thanks for showing the power of social media to grow any business. Really we can increase our audience, earning and popularity using social media platform. Thanks a lot for this useful post. Is social media traffic will grow up your business on regular basis or on temporary basis ? If you stay active on social media, more potential customers will see you and it will keep growing it indefinitely. Incredible article. Much obliged for offering this article to us. Thanks for this! Any thoughts on chatbots? Nick would love you to read ..How Much Is Helium 10? Personally, I don’t mind acknowledgements or even offers from chatbots, but I still expect a human to answer the questions a bot can’t answer. Any brand that only uses automation so they can ignore their potential customers is going to be disappointed when they get tuned out. Enjoyed this article! Recently i have been looking into using chatbots. A lot of my initial research is showing that people tend to interact better inside of facebook messenger in comparison to emails. I think chatbots are just more common on Facebook right now than elsewhere. One of my internet providers uses them to try to get people to sign up with them. Another uses them to try to sell me products. If I can’t get a live person to answer me, though, those tactics won’t work ON ME. They may well work on the masses. thanks to sharing this amazing and powerful article with us. we all know the importance of social media to drive more traffic to grow business. I strongly agree with the ”Building a Story Around Your Brand” because people often want to learn or feel interest to know more about the brands. If we make the story around our brands they will swallow it properly. With the help of Social media we can increase ow business. Many social site available in google. With the help of this site we are increase own business. It’s effective article as you defined, explained social media as it useful for free website builder one of the best ways I’ve seen. This is exactly most important to us. This is very helpful to grow business by using social media. All technique is most important to me. I have taken summery which is very needed to grow business used by social media. Thank you, sir, and I request you. your welcome to my side, please visit my website. I have learned many things. I hope, you always post this type of news. Thanks a lot for sharing your experience. I own a website and that is powered by Wix. I am not familiar with html coding. So i used to create website with Wix. I wanted to create a blog in WordPress. But Wix doesn’t support WordPress blog. I want to transfer domain to WordPress, so that i can publish articles easily. Can i transfer my domain to WordPress???? These are the links of my sites. Some great ways to grow social engagements for my blog. Thanks for sharing this post, Its Really helpful for me. i got some new ideas from here. Firstly I would love to appreciate the blog you shared. I loved the way strategy you used to explain by the example of “Brand Hero”. Will implement these points in my upcoming year 2019. Once again thanks for sharing an amazing article. The “Brand Hero” idea looks that can really work in Fitness niche, for example, but I don’t think that it works with all publics. But probably all these tips worth the try. About the twitter, have a different account for support is also a better because your can transfer the “hate” from your original social media account that can make you lose some sales. Everything you mentioned is 100% correct. But my personal fav. is to tell a personal story and create a brand around it. It really helped me gain audience (a loyal one), which helped me increase my sales. All points are very essential to stay on top or in business. I try to exercise better customer services as well. Im sure your post is useful for me. Thanks Mates. Social media has been my greatest challenge. There are so many different types and different ways of doing it. Not so sure about what is best for me. Using social media is such an important platform in this day and age. Learning the best way to use it has been my biggest challenge. This was a helpful read. Social media is not a place I am super comfortable with but I understand how important it is to my business. I just need to learn the best way to use it. Hi Arzeen, I’d love to make more stories around my business for 2019. I’m not sure how since I’m a service business and not a retailer. I’d love to read more topics on that in the coming year. Thanks for the tips and suggestions here. I love Twitter for customer service, it’s the BEST! Have a great day and weekend ahead! Great read! Tweeting great customer service is such a great idea, and I also agree that Influencers can really help your business! Especially those influencers in Youtube, and IG! You Are Great i am so happy with your article. Social media is the new age internet and I doubt it’ll ever stop working for businesses. Almost everyone and their grandma uses social media and if you’re leaving this medium to promote your business, you’re doing a big marketing mistake. Larry Hryb is a great guy and I have been following him for long. He clearly thought “out of the box” with his Insta profile. Thanks for sharing the amazing tips. Social media is best way to grow business rapidly. I think if anyone follow this 6 rules which you mentioned in post, it whould be easy task for anyone to grow traffic and business. but main thing is quality. we all have to provide good quality to satisfied customers. above listed 6 tips helps me a lot to grow my conveyor belt manufacturers business through social media channels thanks for sharing it. waiting for more content like this. You had written a great article which is very easy to understand. Thanks a lot, Azreen for sharing. It is very helpful. Great article. Thanks a lot for sharing this article with us. Influencers can take your business to the next level Azreen if you cultivate bonds with these top pros. Gail has always done it right; she builds friendships with top bloggers, over years. Awesome way to open so many doors. Building a great social media is a daunting task, I must say you have included some great points which I can effectively introduce in my strategy plan. A well written informative Article. Yesm exploring paid media is the best way to grow our business. If we spend much, in return we will earn much. Engaging users also is the main point to grow in every market. Thanks for the very key points you have raised.